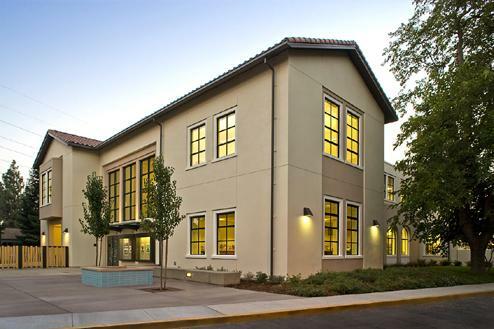 Sacramento Country Day School is located on Latham Drive in the Sierra Oaks neighborhood within walking distance of cafes, coffeehouses, grocery stores, and shops. Latham Drive is off Munroe, between Fair Oaks Boulevard and American River Drive. Quads and plazas provide areas for students and faculty to gather and enjoy the beautiful Sacramento weather. The 11-acre campus includes the Frank Science Center, the Middle School Center for Science, Mathematics, and Technology, art and music studios (including a state-of-the art recording studio), two spacious and well-stocked libraries, a full-sized gymnasium and weight room, expansive playing and athletic fields, and separate fenced playgrounds for both pre-kindergartners and kindergartners. Our half-acre organic garden is an outdoor classroom and provides our students opportunities for service learning as they share garden produce with the local food bank. Although there are distinct areas for our High School (Grades 9-12); Middle School (Grades 6-8); Lower School (Kindergarten – 5th Grade); and the Early Childhood Education Center for Pre-Kindergarten students, there are many places for our big and little students to connect and interact in supportive, loving ways. Exit at Fulton Avenue and go south. Continue south on Fulton past Fair Oaks Boulevard (Fulton Avenue becomes Munroe), turn left on Latham Drive. Country Day is one-half block on the right. Exit at Howe Avenue/Power Inn Road and go north. Continue north for approximately one mile and turn right at American River Drive. At the first stop light (Munroe), turn left. Turn right on Latham Drive. Country Day is one-half block on the right. Go east on “J” Street, it will become Fair Oaks Blvd. Turn right on Munroe and left on Latham Drive. Country Day is one-half block on the right.